How can you help Canadian employers understand what skills you bring to the table and how do you tell your professional story in a way that makes it relevant to the local context? On November 16, 2017, 22, recent immigrants to Canada had a unique opportunity to hear first hand from TELUS team leaders and hiring managers about ways to make a successful transition to the Canadian labour market. A strong champion of diversity and inclusiveness, TELUS has been an active participant in the MentorConnect Program administered by the Immigrant Employment Council of BC since its inception. Over 100 company employees have volunteered their time and shared their professional expertise, providing one-on-one, industry-specific coaching to new immigrants. TELUS’ efforts in integrating skilled immigrant talent and fostering workplace diversity have been recognized with an IEC-BC 2016 Leadership Award. 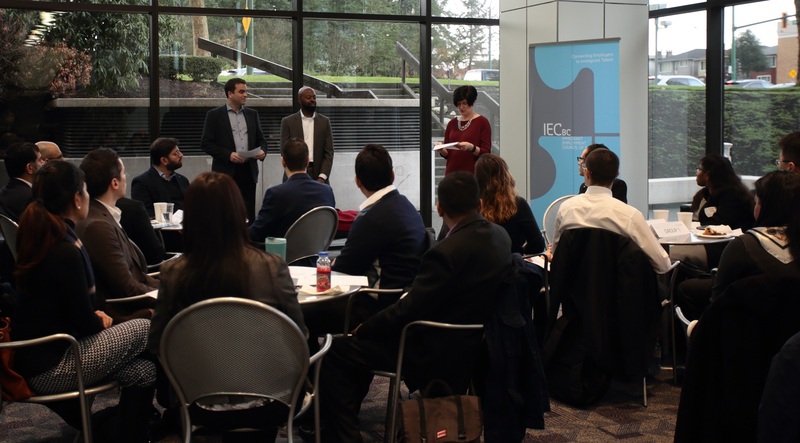 The Group Mentoring Event marked a new chapter in the organizations’ joint efforts to effectively connect BC employers to immigrant talent. Co-organized by IEC-BC and TELUS, the Group Mentoring Event aimed to boost immigrants’ understanding of Canadian workplace specifics, equip them with skills that would improve their chances of finding meaningful employment in Canada, and give them an opportunity to network with like-minded professionals. “Making the transition [to a foreign country] rewarding requires determination, and it also requires help and support from others,” said Laurette Rajotte Martorana, Director of Client Service and Project Management at TELUS, noting that this approach is fundamental to her organization’s corporate culture. “As a company, TELUS not only recognizes that its workforce must be reflective of the diversity of customers that it serves,” she noted. “It also requires a diverse and inclusive workforce in order to drive innovation and collaboration that would boost the services that provide value to our customers.”. Participants spoke highly about the innovative, panel-style format of the event, which allowed them to share their experiences with peers, and receive “meaningful and very specific tips on how to be successful” in the Canadian labour market. IEC-BC and TELUS plan to continue working together – to deliver one-on-one coaching and to expand group mentoring in the framework of MentorConnect.